Are you ready for all-out war? Skybound and McFarlane Toys are! 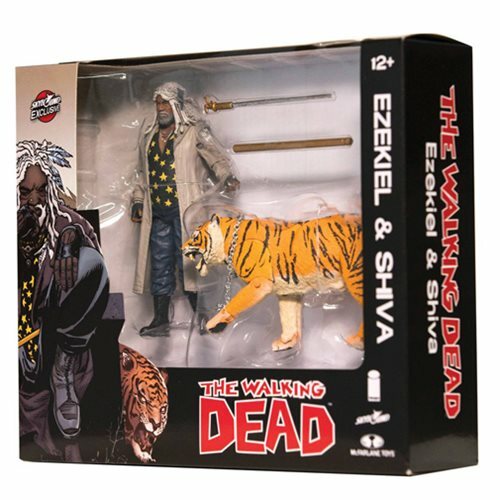 This sensational Walking Dead Comic Ezekiel & Shiva All Out War Figure 2-Pack features the leader of The Kingdom and his ferocious tiger. The Skybound exclusive presents Ezekiel in his All Out War color scheme, with his trusty cane sword and sheath and a chain-link leash for Shiva. Be sure to check out the Walking Dead Comic Ezekiel & Shiva All Out War Bloody Figure 2-Pack, too (sold separately). Ages 12 and up.